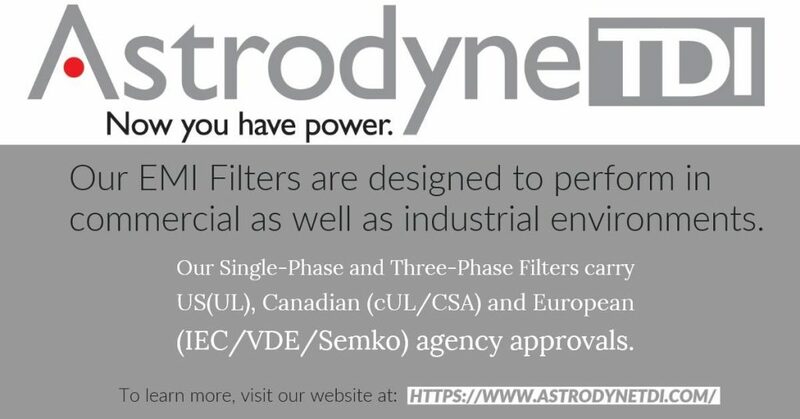 Astrodyne TDI: Three-Phase Filters for Commercial and Industrial Environments » HHP Associates, Inc.
A leading supplier of three-phase filters, Astrodyne TDI’s filters are designed to perform in commercial as well as industrial environments. Astrodyne TDI’s three phase filters are rated up to 480VAC, 520VAC and 600VAC for both delta and WYE configurations. Current ratings are available up to 2500A. Single, dual and multi stage designs are available for specific needs. Versions rated at higher current and voltages can be offered upon request. We are honored to serve as a manufacturer’s rep for Astrodyne TDI, a manufacturer of power supplies and EMI filters for industrial, semiconductor manufacturing, medical, consumer appliance, military, aerospace, and many varied markets.